Many clinical experiments have been conducted to show the effectiveness of Ayurvastra. It was found through various trials that such an environment can help those suffering from skin diseases, arthritis. Eczema, psoriasis and rheumatism and blood pressure. All these trials showed a "marked improvement." The Dravyaguna Department (Ayurveda Pharmacology Department) of Government Ayurveda College conducted a month-long trial by using bedding, rugs and towels made from Ayurvastra and they found that it helped the patients who suffered from diseases like eczema, psoriasis and rheumatism. According to Dr. Vishwanathan, the former Dean of the Drug Research Department at Ayurveda College, "We treated around 40 people. And the response was remarkably good, especially in cases of arthritis and skin ailments." Based upon the successful results of this clinical trial, the Kerala State Government has initiated a more in-depth and expanded study into the possible effectiveness of Ayurvastra in the treatment of other ailments including cancer. A similar study was conducted to test the efficacy of medicated coir mats too. Initiated by the Ministry of Health, the Department of Coir Development, Government of Kerala undertook a six-month clinical trial at the Government Ayurveda College in Thiruvananthapuram on patients suffering from rheumatism, allergy, hypertension, diabetes, psoriasis and other skin ailments. For the study, all clothes, bed linens and mattresses of the patients were dyed in Ayurvastra herbs and the walls, floors and ceilings in the patient’s room were lined with Ayurvastra coir mats so that the patient were surrounded by Ayurvastra medicated materials. The improvements in the health of patients suffering from rheumatism and arthritis are especially interesting because rheumatism and arthritis are not skin disorders and this indicate that the treatments might have healthy benefits that extend beyond the periphery of skin problems. By coming in contact with Ayurvastra, the body loses toxins and its metabolism is enhanced. The most effective time to wear Ayurvastra clothing is when the body is most at rest such as during sleep or meditating because this is when the body is naturally healing and re-establishing its balance. 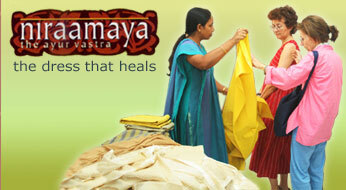 This is why Ayurvastra cloth is often used as sleepwear, bed sheets, towels, meditation clothes and coir mats. 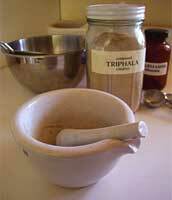 Conventional Western medicine and traditional Eastern medicine recognize the skin as being the body’s largest organ. The skin can act as a barrier but also as a conduit for outside substances to enter the body. Many environmental toxins and chemicals in conventional clothing are assimilated into the body through the skin. Anything which can improve the skin’s natural ability to block and resist harmful chemicals and toxins from entering the body will be beneficial to health. Ayurveda identifies seven unique layers of the skin where each layer has a distinct function. Starting from the outermost layer, the seven layers defined by Ayurveda are Avabhasini, Lohita, Shweta, Tamra, Vedini, Rohini and Mamsadhara. The fourth layer, Tamra, supports the immune system and performs the function of acting as a barrier. Skin infections reflect an imbalance in this layer. The Ayur vastra cloth and clothing can improve the skin’s ability to act as a barrier to external and environmental toxins, the wearer’s health might be improved.